This article is about the North American squirrel. For Asian rock squirrels, see Sciurotamias. The rock squirrel (Otospermophilus variegatus) is a species of rodent in the family Sciuridae and is native to Mexico and the southwestern United States. Rock squirrels are one of the largest members of the family Sciuridae, with adults measuring up to 21 inches (53 cm) in length. 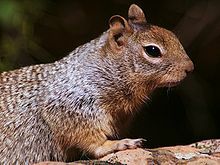 In front and on top, the squirrel's coat is a speckled grayish brown; on the rear and bottom the gray becomes a more mottled brownish-black tone. They have a marked light-colored ring around their eyes and pointed ears that project well above their heads. Rock squirrels have a long bushy tail with white edges. The female rock squirrel has two litters a year, with three to nine young in each litter. The first litter is typically born between April and June, while the second is born between August and September. They are active in the early morning and late afternoons when it is warm – when very hot, they may estivate. They are social, and live in colonies with several females and one dominant male who fights other mature males to protect the group. Subordinate males lurk at the outer boundaries of the group. Rock squirrels dig burrows with their sharp claws and muscular legs. The burrows provide shelter, safety, living space, and food storage. Burrow systems can be complex and lengthy, as they are enlarged over a period of years. Entrances are usually hidden beneath rocks and can be larger than 3 inches in width. In the northern reach of their habitat, rock squirrels hibernate during the colder months of the year. In southern areas, rock squirrels may not hibernate at all. They can withstand long periods of time without water, some even up to 100 days. When alarmed, they whistle a short, sharp, oscillating call. The rock squirrel is predominantly a herbivore, eating mostly leaves, stems, and seeds. They also eat acorns, pine nuts, and fruits of native plants, including cacti. The rock squirrel forages for its food on a daily basis, by climbing trees and bushes and finding on the ground. These foraging trips are generally short-lived, usually only lasting approximately 12 minutes. Most foraging is done during the morning hours, to avoid the hotter parts of the day. They eat some of the food right away and bring a significant portion back to a lookout point, where they can safely consume the rest. Occasionally, they consume insects or the eggs of small nesting birds. The rock squirrel may eat their own kind, scavenging the remains of squirrels that are already dead. Its diet changes with the seasons, accustoming itself to what is available locally. ^ Linzey, A. V.; Timm, R.; Álvarez-Castañeda, S. T.; Castro-Arellano, I. & Lacher, T. (2008). "Spermophilus variegatus". IUCN Red List of Threatened Species. Version 2008. International Union for Conservation of Nature. Retrieved 8 January 2009. ^ Helgen, Kristofer M.; Cole, F. Russel; Helgen, Lauren E. & Wilson, Don E (2009). "Generic Revision in the Holarctic Ground Squirrel Genus Spermophilus" (PDF). Journal of Mammalogy. 90 (2): 270–305. doi:10.1644/07-MAMM-A-309.1. Archived from the original (PDF) on 22 October 2011. ^ March, p. 2 2. ^ "ADW: Spermophilus variegatus: INFORMATION". Animal Diversity Web. "Rock Squirrel - Spermophilus Variegatus." Rock Squirrel. N.p., n.d. Web. 14 May 2015. Oaks, Emily C.; Kirkland, Gordon L.; Schmidt, David F.; Young, Paul J. (1987). Spermophilus Variegatus. Soc. This page was last edited on 7 March 2019, at 22:52 (UTC).